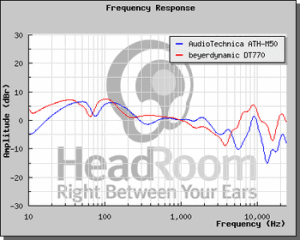 HomeHeadphone ComparisonsBeyerdynamic DT770 vs. ATH M50x | SEPARATED AT BIRTH? Beyerdynamic DT770 vs. ATH M50x | SEPARATED AT BIRTH? Before we get into the Beyerdynamic DT770 vs. ATH M50x comparison, grab a snack, sit back and relax because.. Both have a fun sound, and really aren’t meant for critical listening situations. Their sound signatures are V-shaped. What this basically means is that the bass and treble are boosted at the expense of the mid-range. They both also have a strange dip around 60-80 Hz. Both have good sound isolation. Both wires are long and durable. Both are strong like ox, and can withstand a lot of abuse. I’ve had the M50 (original model) since Jan. 2013 and it’s been battered like you wouldn’t believe. Still holding up like a champ! Both have great clarity and detail. For closed back models, the DT770 and M50x have pretty impressive Soundstage. What is Soundstage? Now some people may fight me on this, but when I first put on the M50’s I was blown away. I could perceive sounds all around me, and frequently had to take off the headphones to see if it was coming from outside or not. This may be due to the fact that I was noob, but nonetheless I was quite impressed. Both are pretty versatile, and can handle a wide variety of genres. Both have impressive bass, and it doesn’t feel cheap, muddy, or overblown. The M50’s bass is most definitely it’s best feature. It packs a nice wallop, but rarely feels overdone. Both headphones have a treble response that can sometimes be a little harsh/sibilant, which leads to fatigue. What does Sibilant mean? Both have a mid-range that is virtually non-existent. Both are a little bulky. I would have to sit down and really think about whether I would take either out in public. They’re kind of in the middle of being very small and very large. I used to take the M50 along with me everywhere when I only had one set of headphones. It’s not the size of the cans themselves, but rather the cable is a bit too long. Shoving it in your pocket is kind of irritating, so I resorted to coiling some of it up and using a couple of rubber bands. Did the trick. Ear pads. The DT770’s have that amazing velour, while the M50x’s sport the faux leather. Impedance. The DT770’s come in 250 Ohm, 80 Ohm, or 32 Ohm impedance, while the M50’s only come in one which is 38. What is Headphone Impedance? Color. The M50x’s are mostly black with some hints silver, while the DT770’s are grey and black. The M50x’s also come in an array of colors while the 770’s do not. Comfort. The DT770’s are more comfortable than the M50x’s. That’s not to say the 50x’s aren’t comfortable, but you will be making more adjustments with them. Detachable cable. The M50x’s have it, while the 770’s do not. The 50x’s are also protected by a chromed metal coil at the end. The adapter and plug are both extremely rugged. Amp/DAC. The 250 Ohm DT770’s definitely need an amp, while the 80 Ohm and 32 Ohm do not. The M50’s do not need one at all. Both of these headphones have a very similar sound signature and overall sound. It’s fun, lively, and very intense. While I love both of these, for a fun listen I really have to recommend the Sennheiser HD25’s. They are rated #1 in on-ear headphones at Head-Fi, and sport a lively sound like the above mentioned. The difference is that they still manage to be more analytical, detailed, and fast while at the same time 1) not having that weird bass hump and 2) still having an exciting sound. If you’re still curious about the 770 and M50, check out my official reviews! AUDIO TECHNICA ATH M50 REVIEW!! Well that’s about it for today my friend! I hope you’ve enjoyed this article on the Beyerdynamic DT770 vs. ATH M50x. Are you convinced that the HD 25 is the way to go? Would you consider the 770 or M50? I would love to hear from you. Until next time..
Real life story me and a friend of mine both own these brands. I like one better than the other vice versa for him. We had this argument last weekend over these headphones on which is better than the other. I will gladly show him this article and prove my point. ATH M50X wins all day over 770 in my opinion. Haha, nice! The 770 is a good headphone, but by no means Beyerdynamics best. Have you tried any of the others like the 990, 880 etc. ?